Following the great success and enthusiasm stirred up at the Louis Vuitton Classic held on June 5 at Waddesdon Manor (UK), today the Pininfarina Enjoy makes its debut in Japan at the Hara Contemporary Art Museum in Tokyo on the occasion of an event arranged by CELUX Club of Louis Vuitton Japan, attended by CELUX members, representatives of national and local institutions, V.I.P.s and members of the Japanese press. Inspired by the concept car of the same name which was presented at the Geneva Motor Show in 2003, the Enjoy is a dream come true, even if just for the lucky few. 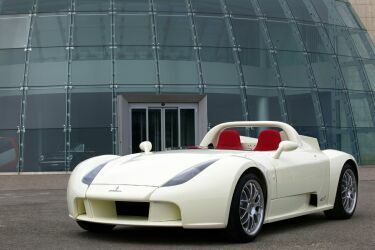 After a tour in Europe and Far East (London, Tokyo, Singapore, Paris) for presenting this special car to collectors and enthusiasts, Pininfarina will manufacture and sell it in only 75 units during 2005 to celebrate the Company’s 75th anniversary. And thanks to the Enjoy Pininfarina has started up a new prestigious partnership with the most important luxury brand in the world, Louis Vuitton, which was commissioned to work on the interior design of the vehicle. Enjoy, the first Pininfarina branded car, is an ambitious project, the idea of building an “exclusive” car with a production run of less than a 100, with top design, technical features and performance, combined with detailed craftsmanship, represents an equation that no other manufacturer has managed to pull off. Thanks to the recent acquisition of the engineering, testing and prototyping divisions of Matra Automobile, which has a tried and tested culture in terms of mechanical work, Pininfarina has been able to extend its areas of expertise and become a genuine car manufacturer, turning the Enjoy into an exclusive and innovative product. In order to underline the internationalization of the Group, the style as well as the engineering development of the exterior have been performed in Turin, while the interior development has been carried out by the technical staff of Matra Automobile Engineering. The production is planned in Matra’s prototyping workshop and final delivery for the lucky few will take place at CERAM, the proving ground of the Pininfarina Group located near the Roissy-Charles De Gaulle Airport, where the customers will also be able to personally test the car. The Enjoy thus represents the living, “functioning” proof that Pininfarina is a flexible partner able to offer the big manufacturers a full range of services, from styling to design to niche production. This is the result of a reorganisation process that got underway back in 2000. The focus of activities has branched out from the styling sector (all-comprehensive, from cars to means of transport and items in everyday use) and production of niche cars - areas in which Pininfarina has traditionally excelled - to now include design and development too. The aim was to create a total services Company capable of operating on an all-round basis in the car sector. In operating terms this means being able to offer manufacturers the complete cycle for producing a new vehicle or single, specific services for the car design, engineering and production phases. So, today Pininfarina is an industrial Group with locations in Italy, Germany, France, Sweden and Morocco, about 2,500 employees, 780 million euros as consolidate value of production, 70,000 cars as yearly production capacity, 1,500,000 hours as yearly engineering capacity. This new important step forward for Pininfarina has been strongly pursued by its President and CEO, Andrea Pininfarina. Born in Turin on June 26 1957, graduated in Mechanical Engineering in 1981 at the Polytechnic of Turin, he began his career in 1982 in the United States. In 1983 he joined "Industrie Pininfarina S.p.A.". Since 2001, he holds the position of President & Chief Executive Officer of the holding company, Pininfarina S.p.A., a position that he continues to hold also after the merger by absorption of Industrie Pininfarina S.p.A. and Pininfarina Ricerca e Sviluppo S.p.A. into Pininfarina S.p.A., effective on January 1, 2004. In 2003 he was appointed Chairman of the controlled French company Matra Automobile Engineering S.A.S.. He also holds significant posts in different associations: since May 2004 he is Vice President of CONFINDUSTRIA - Research Department. Around the world, people are discovering the emotional and aesthetic content of automobiles, as a negation of the flatness and commonplaceness of the forms and architecture around them. The Pininfarina Enjoy reflects this true passion for handsome cars, beautiful coachwork, fine mechanics, innovative transgression. The Enjoy is the first Pininfarina branded car, but it is not the first “fuoriserie” conceived by the Company. When Battista “Pinin” Farina founded Carrozzeria Pinin Farina, in 1930, the Company was designed to build special car bodies for individual customers or very limited series, like a standard-cut suit from a fashion house. That demonstrated Pinin Farina’s precocious fame within a group of highly talented craftsmen. With the advent of mass production Pininfarina evolved obtaining the necessary structure and technological means. Nevertheless, the production of specially designed and finished custom-built car bodies has never stopped. Pininfarina’s strength still lays in the designer’s fertile creative vein, and the exceptional ability of the craftsmen to transform the sketches and intuitions into elegant, proportional three dimensional objects manufactured with inventiveness and precision in every aesthetical and functional detail. Unique cars for clients who can afford the best of everything available, without limitation, and order a car body tailor-made in Italy. This means a valorisation of the “producer of ideas” face of the operation, and this has become an independent activity of the Pininfarina Group.